Atherosclerosis is a condition in which a material called plaque builds up on the inner walls of the arteries. This can happen in any artery, including the coronary arteries, which carry oxygen-rich blood to your heart. When atherosclerosis affects the coronary arteries, the condition is called coronary artery disease (CAD). Reduce damage to the heart muscle from a heart attack. A heart attack occurs when blood flow through a coronary artery is completely blocked. Angioplasty is used during a heart attack to open the blockage and restore blood flow through the artery. Angioplasty is done on more than a million people a year in the United States. Serious complications don't occur often, but can happen no matter how careful your doctor is, or how well he or she does the procedure. Research on angioplasty is ongoing to make it safer and more effective, to prevent treated arteries from closing again and to make the procedure an option for more people. Coronary angioplasty is used to restore blood flow to the heart when the coronary arteries have become narrowed or blocked due to coronary artery disease (CAD). When medicines and lifestyle changes, such as following a healthy diet, quitting smoking and getting more physical activity, don't improve your CAD symptoms, your doctor will talk to you about other treatment options. These options include angioplasty and coronary artery bypass grafting (CABG), a type of open-heart surgery. Your doctor will take into account a number of factors when recommending the best procedure for you. These factors include how severe your blockages are, where they're located, and other diseases you may have. Angioplasty is often used when there is less severe narrowing or blockage in your arteries and when the blockage can be reached during the procedure. CABG might be chosen if you have severe heart disease, multiple arteries that are blocked, or if you have diabetes or heart failure. Angioplasty also is used as an emergency procedure during a heart attack. As plaque builds up in the coronary arteries, it can burst, causing a blood clot to form on its surface. If the clot becomes large enough, it can mostly or completely block blood flow to part of the heart muscle. Quickly opening a blockage lessens the damage to the heart during a heart attack and restores blood flow to the heart muscle. Angioplasty can quickly open the artery and is the best approach during a heart attack. A disadvantage of angioplasty as compared with CABG is that the artery may narrow again over time. The chance of this happening is lower when stents are used, especially medicine-coated stents. However, these stents aren't without risk. In some cases, blood clots can form in the medicine-coated stents and cause a heart attack.  Your doctor will discuss with you the treatment options and which procedure is best for you. Before coronary angioplasty is done, your doctor will need to know whether your coronary arteries are blocked. If one or more of your arteries are blocked, your doctor will need to know where and how severe the blockages are. To find out, your doctor will do an angiogram and take an x-ray picture of your arteries. During an angiogram, a small tube called a catheter with a balloon at the end is put into a large blood vessel in the groin (upper thigh) or arm. The catheter is then threaded to the coronary arteries. A small amount of dye is injected into the coronary arteries and an x-ray picture is taken. This picture will show any blockages, how many, and where they're located. Once your doctor has this information, the angioplasty can proceed. Your doctor will blow up (inflate) the balloon in the blockage and push the plaque outward against the artery wall. This opens the artery more and improves blood flow. The illustration shows a cross-section of a coronary artery with plaque buildup. The coronary artery is located on the surface of the heart. Figure A shows the deflated balloon catheter inserted into the narrowed coronary artery. 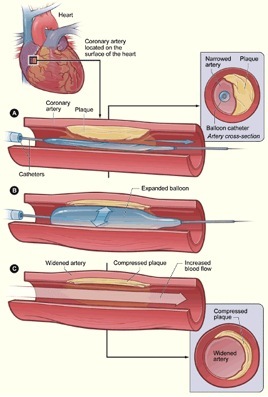 In figure B, the balloon is inflated, compressing the plaque and restoring the size of the artery. Figure C shows the widened artery. A small mesh tube called a stent is usually placed in the newly widened part of the artery. The stent holds up the artery and lowers the risk of the artery re-narrowing. Stents are made of metal mesh and look like small springs. Some stents, called drug-eluting stents, are coated with medicines that are slowly and continuously released into the artery. These medicines help prevent the artery from becoming blocked again from scar tissue that grows around the stent. The illustration shows the placement of a stent in a coronary artery with plaque buildup. Figure A shows the deflated balloon catheter and closed stent inserted into the narrowed coronary artery. The inset image on figure A shows a cross-section of the artery with the inserted balloon catheter and closed stent. In figure B, the balloon is inflated, expanding the stent and compressing the plaque to restore the size of the artery. Figure C shows the stent-widened artery. The inset image on figure C shows a cross-section of the compressed plaque and stent-widened artery. In some cases, plaque is removed during angioplasty. In a procedure called atherectomy, a catheter with a rotating shaver on its tip is inserted into the artery to cut away plaque. Lasers also are used to dissolve or break up the plaque. These procedures are now rarely done because angioplasty gives better results for most patients. When to begin fasting (not eating or drinking) before the procedure. Often you have to stop eating or drinking by midnight the night before the procedure. What medicines you should and shouldn't take on the day of the angioplasty. Even though angioplasty takes one to two hours, you will likely need to stay in the hospital overnight. In some cases, you will need to stay in the hospital longer. Your doctor may advise you not to drive for a certain amount of time after the procedure, so you may have to arrange for a ride home. Coronary angioplasty is performed in a special part of the hospital called the cardiac catheterization laboratory. The "cath lab" has special video screens and x-ray machines. Your doctor uses this equipment to see enlarged pictures of the blocked areas in your coronary arteries. In the cath lab, you will lie on a table. An intravenous (IV) line will be placed in your arm to give you fluids and medicines. The medicines will relax you and prevent blood clots from forming. These medicines may make you feel sleepy or as though you're floating or numb. The area where the catheter will be inserted, usually the arm or groin (upper thigh), will be shaved. The shaved area will be cleaned to make it germ-free and then numbed. The numbing medicine may sting as it's going in. When you're comfortable, the doctor will begin the procedure. You will be awake but sleepy. A small cut is made in your arm or groin into which a tube called a sheath is put. The doctor then threads a very thin guide wire through the artery in your arm or groin toward the area of the coronary artery that's blocked. Your doctor puts a long, thin, flexible tube called a catheter through the sheath and slides it over the guide wire and up to the heart. Your doctor moves the catheter into the coronary artery to the blockage. He or she takes out the guide wire once the catheter is in the right spot. A small amount of dye may be injected through the catheter into the bloodstream to help show the blockage on x-ray. This x-ray picture of the heart is called an angiogram. Next, your doctor slides a tube with a small deflated balloon inside it through the catheter and into the coronary artery where the blockage is. When the tube reaches the blockage, the balloon is inflated. The balloon pushes the plaque against the wall of the artery and widens it. This helps to increase the flow of blood to the heart. The balloon is then deflated. Sometimes the balloon is inflated and deflated more than once to widen the artery. Afterward, the balloon and tube are removed. In some cases, plaque is removed during angioplasty. A catheter with a rotating shaver on its tip is inserted into the artery to cut away hard plaque. Lasers also may be used to dissolve or break up the plaque. If your doctor needs to put a stent (small mesh tube) in your artery, another tube with a balloon will be threaded through your artery. A stent is wrapped around the balloon. Your doctor will inflate the balloon, which will cause the stent to expand against the wall of the artery. The balloon is then deflated and pulled out of the artery with the tube. The stent stays in the artery. After the angioplasty is done, your doctor pulls back the catheter and removes it and the sheath. The hole in the artery is either sealed with a special device, or pressure is put on it until the blood vessel seals. During angioplasty, strong antiplatelet medicines are given through the IV to prevent blood clots from forming in the artery or on the stent. These medicines help thin your blood. They're usually started just before the angioplasty and may continue for 12-24 hours afterward. After coronary angioplasty, you will be moved to a special care unit, where you will stay for a few hours or overnight. While you recover in this area, you must lie still for a few hours to allow the blood vessels in your arm or groin (upper thigh) to seal completely. While you recover, nurses will check your heart rate and blood pressure. They also will check your arm or groin for bleeding. After a few hours, you will be able to walk with help. The place where the tube was inserted may feel sore or tender for about a week. How much activity or exercise you can do. When you should follow up with your doctor. What medicines you should take. What you should look for daily when checking for signs of infection around the area where the tube was inserted. Signs of infection may include redness, swelling or drainage. When you should call your doctor. For example, you may need to call if you have a fever or signs of infection, pain or bleeding where the catheter was inserted, or shortness of breath. When you should call 9-1-1 (for example, if you have any chest pain). Your doctor will prescribe medicine to prevent blood clots from forming. Taking your medicine as directed is very important. If a stent was inserted, the medicine reduces the risk that blood clots will form in the stent. Blood clots in the stent can block blood flow and cause a heart attack. Most people recover from angioplasty and return to work about one week after being sent home. Your doctor will want to check your progress after you leave the hospital. During the follow-up visit, your doctor will examine you, make changes to your medicines if needed, do any necessary tests and check your overall recovery. Use this time to ask questions you may have about activities, medicines or lifestyle changes, or to talk about any other issues that concern you. Although angioplasty can reduce the symptoms of coronary artery disease (CAD), it isn't a cure for CAD or the risk factors that led to it. Making healthy lifestyle changes can help treat CAD and maintain the good results from angioplasty. Talk with your doctor about your risk factors for CAD and the lifestyle changes you'll need to make. For some people, these changes may be the only treatment needed. Follow a healthy diet to prevent or reduce high blood pressure and high blood cholesterol and to maintain a healthy weight. Take medicines as your doctor directs to lower high blood pressure or high blood cholesterol. Your doctor may want you to take part in a cardiac rehabilitation (rehab) program. Cardiac rehab helps people with heart disease recover faster and return to work or daily activities. Cardiac rehab includes supervised physical activity, education on heart healthy living and counseling to cut down on stress and help you return to an active life. Your doctor can tell you where to find a cardiac rehab program near your home. "Your Guide to Living Well With Heart Disease," will give you more information on cardiac rehab. What Are the Risks of Coronary Angioplasty? Bleeding from the blood vessel where the catheter was placed. Damage to blood vessels from the catheter. An allergic reaction to the dye given during the angioplasty. The need for emergency coronary artery bypass grafting during the procedure (two-four percent of people). This may occur when an artery closes down instead of opening up. Damage to the kidneys caused by the dye used. Heart attack (three-five percent of people). Stroke (less than one percent of people). As with any procedure involving the heart, complications can sometimes, though rarely, cause death. Less than two percent of people die during angioplasty. Sometimes chest pain can occur during angioplasty because the balloon briefly blocks off the blood supply to the heart. There is a chance that the artery will become narrowed or blocked again in time, often within six months of angioplasty. This is called restenosis. 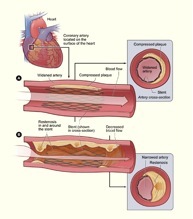 The illustration shows the restenosis of a stent-widened coronary artery. The coronary artery is located on the surface of the heart. In figure A, the expanded stent compresses plaque, allowing normal blood flow. The inset image on figure A shows a cross-section of the compressed plaque and stent-widened artery. In figure B, the plaque grows (over time) through and around the stent, causing a partial blockage and abnormal blood flow. The inset image on figure B shows a cross-section of the growth of the plaque around the stent. When a stent isn't used, four out of 10 people have restenosis. When a non-medicine-coated stent is used, two out of 10 people have restenosis. The growth of scar tissue in and around the stent also can cause restenosis. Medicine-coated stents reduce the growth of scar tissue around the stent and lower the chance of restenosis. When medicine-coated stents are used, the chance of restenosis is lowered even more, to around one in 10 people. Other treatments, such as radiation, can help prevent tissue growth within a stent. For this procedure, the doctor puts a wire through a catheter to where the stent is placed. The wire releases radiation to stop any tissue growth that may block the artery. Recent studies suggest that there is a higher risk of blood clots forming in medicine-coated stents compared to bare metal stents (nonmedicine-coated). The Food and Drug Administration (FDA) reports that medicine-coated stents usually don't cause complications due to blood clots when used as recommended. When medicine-coated stents are used in people with advanced CAD, there is a higher risk of blood clots, heart attack and death. The FDA is working with researchers to study medicine-coated stents, including their use in people with advanced CAD. Taking medicine as prescribed by your doctor can lower the risk of blood clots. People with medicine-coated stents are usually advised to take an anti-clotting drug, such as clopidogrel and aspirin, for months to years to lower the risk of blood clots. As with all procedures, it's important to talk to your doctor about your treatment options, including the risks and benefits to you. More information is available on the Cardiovascular Center Angioplasty and Stenting website page.